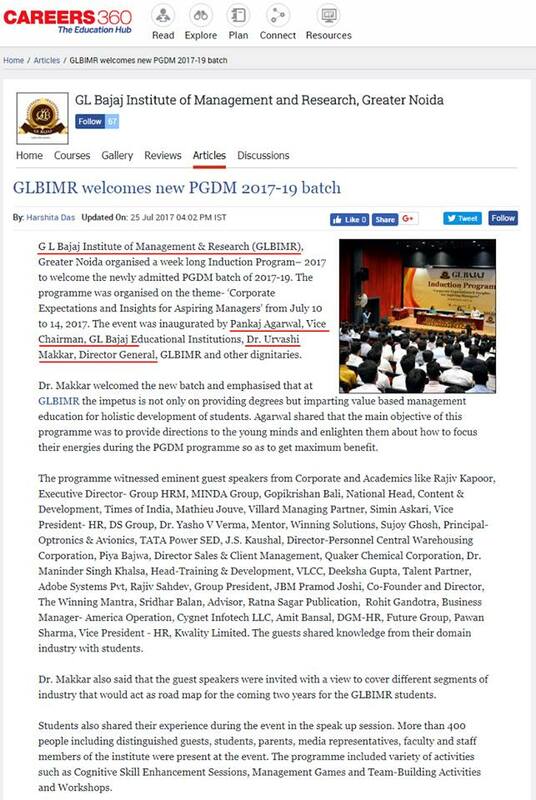 GLBIMR Welcomes PGDM Batch 2017-19 ! The Inaugural session, held on July 10, 2017 witnessed eminent guest speakers from corporate leadership, like, Mr. Rajiv Kapoor, Executive Director-Group HRM, MINDA Group, Ms. Deeksha Gupta , Talent Partner, Adobe Systems Pvt. Ltd and Mr. Rohit Gandotra, Business Manager- America Operation, Cygnet Infotech LLC. The guests emphasized the importance of using innovative pedagogy, customized learning system, research orientation, corporate expectations & value based education. They apprised the students with corporate expectations & role of management program in making them employable professionals. More than 400 audiences comprising of distinguished guests, students, parents, media representatives, faculty and staff members of the Institute were present in the glittering event. The Induction program will witness Corporate Talk Sessions by many highly illustrious business leaders like Mr. Gopikrishan Bali, National Head Content Development & Training, Times of India, Ms. Simin Askari, Vice President - HR, DS Group, Ms. Vijay Lakshami, Vice President, Centrum Capital Ltd, Mr Anup Mandal, Chief Technology Officer, HT Media Ltd, Mr. Mathieu Jouve, Villard Managing Partner Wedge Consulting, Mr. Anurag Batra, Chairman and Editor in Chief, BusinessWorld, Mr. Rajiv Sahdev, Group President, JBM and many more, in the coming four days. The program will include variety of activities such as Cognitive Skill Enhancement Sessions, Management Games and Team-Building Activities and Workshops.